This antibody detects total level of endogenous kinesin protein. Recombinant fragment corresponding to Human KIF5B. Stalk domain of human KIF5B (amino acids 331-906) expressed in E. coli (FKHC3). Purified from rabbit serum by afinity chromatography. > 95% pure (by SDS PAGE). Our Abpromise guarantee covers the use of ab25715 in the following tested applications. WB 1/1000. Predicted molecular weight: 110 kDa. Microtubule-dependent motor required for normal distribution of mitochondria and lysosomes. Belongs to the TRAFAC class myosin-kinesin ATPase superfamily. Kinesin family. Kinesin subfamily. Contains 1 kinesin motor domain. Composed of three structural domains: a large globular N-terminal domain which is responsible for the motor activity of kinesin (it hydrolyzes ATP and binds microtubule), a central alpha-helical coiled coil domain that mediates the heavy chain dimerization; and a small globular C-terminal domain which interacts with other proteins (such as the kinesin light chains), vesicles and membranous organelles. Cytoplasm, cytoskeleton. Uniformly distributed between soma and neurites in hippocampal neurons. 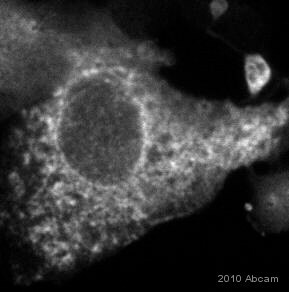 ab25715 staining KIF5B in Human HeLa cells by ICC/IF (Immunocytochemistry/immunofluorescence). Cells were fixed with paraformaldehyde, permeabilzed with 0.1% Triton and blocked with 0.1% BSA for 16 hours at 4°C. Samples were incubated with primary antibody (1/500 in PBS + 0.1% BSA) for 1 hour at 37°C. An Alexa Fluor®546-conjugated donkey anti-rabbit polyclonal (1/1000) was used as the secondary antibody. Publishing research using ab25715? Please let us know so that we can cite the reference in this datasheet. I am emailing you regarding your anti-Kinesin antibody (catalog number ab25715). The product description of this antibody describes it as a pan-Kinesin antibody (an antibody that binds all kinesins). I was hoping to clarify that this is in fact, accurate. 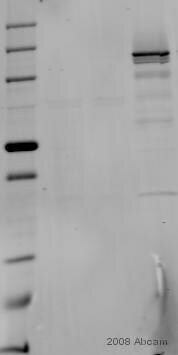 Additionally, I was wondering if it is possible to obtain a small aliquot of this antibody (a few µl) for a western blot experiment to test the activity of this antibody. If the antibody seems to work as it is intended, I would be interested in purchasing stocks of the antibody for my experiments. The immunogen was FKHC3 stalk coiled-coiled domain (aa331-906) of human neuronal kinesin heavy chain. This pAb detects total level of endogeneous kinesin protein. However, we have not and we do not know of any study that has examined its reactivity with all Kinesin isoforms separately. With respect to the immunogen, species reactivity and fact that it is a polyclonal antibody, it is likely the antibody would recognize total kinesin protein, not a particular isoform. You list the immunogen for this Kinesin antibody as "stalk domain of human kinesin (aa 331-906) expressed in E. coli (FKHC3)." Can you please tell me the amino acid sequence this corresponds to? Thank you for contacting us. The immunogen sequence is as follows: VNVELTAEQWKKKYEKEKEKNKILRNTIQWLENELNRWRNGETVPIDEQFDKEKANLE AFTVDKDITLTNDKPATAIGVIGNFTDAERRKCEEEIAKLYKQLDDKDEEINQQSQLVEKL KTQMLDQEELLASTRRDQDNMQAELNRLQAENDASKEEVKEVLQALEELAVNYDQKSQ EVEDKTKEYELLSDELNQKSATLASIDAELQKLKEMTNHQKKRAAEMMASLLKDLAEIGI AVGNNDVKQPEGTGMIDEEFTVARLYISKMKSEVKTMVKRCKQLESTQTESNKKMEENE KELAACQLRISQHEAKIKSLTEYLQNVEQKKRQLEESVDALSEELVQLRAQEKVHEMEKE HLNKVQTANEVKQAVEQQIQSHRETHQKQISSLRDEVEAKAKLITDLQDQNQKMMLEQ ERLRVEHEKLKATDQEKSRKLHELTVMQDRREQARQDLKGLEETVAKELQTLHNLRKLF VQDLATRVKKSAEIDSDDTGGSAAQKQKISFLENNLEQLTKVHKQLVRDNADLRCELPK LEKRLRATAERVKALESALKEAKENASRDRKRYQQEVDRIKEAV Please let me know if you need any additional information.